If you change your mind about your marketing preferences or would like us to update/amend any of your personal data, please contact us via by completing the attached form and we can make sure we have the correct information for you. Mercedes-Benz Retail Group take your privacy seriously. We will only use your personal information to provide the products and services you have requested from us or to administer your account. 1.1 We appreciate your interest in our products and services and your visit to this website. Your privacy is important to us and we want you to feel comfortable with how we use and share your personal information. 1.2 This policy sets out how the ultimate parent company of the Daimler group Daimler AG and the companies within the Daimler Group that are based in the UK handle your personal information, including when and why it is collected, used and disclosed and how it is kept secure. 1.3 You will find our contact details at the end of this policy which you can use if you have any questions, including how to update or access your personal information or to make a complaint. 1.4 This policy may change, so please check this page from time to time to ensure that you’re happy with any changes. Please see further Changes to this policy in Section 11. 1.5 This policy was last updated on 18 December 2017. 2.1 Daimler Group in the UK is made up of numerous individual companies. For further details, including a full list of these companies, please visit About Daimler Group in Section 13. Whenever you deal with one of these companies, the ‘controller’ of your personal information will be the company in our group that you are interacting with or with whom your information has been shared. A ‘controller’ is a company that decides why and how your personal information is processed. 2.2 Where this policy refers to “we”, “our” or “us” below, unless it mentions otherwise, it’s referring to the particular company that is the controller of your personal information. Personal information you give to us: This is information about you that you give to us by entering information via our websites or our social media pages or by corresponding with us by phone, email or otherwise and is provided entirely voluntarily. The information you give to us includes your name, contact details (such as phone number, email address and address), enquiry details and your opinion of our products. Personal information we collect about you: We may automatically collect the following personal information: our web servers store as standard details of your browser and operating system, the website from which you visit our website, the pages that you visit on our website, the date of your visit, and, for security reasons, e.g. to identify attacks on our website, the Internet protocol (IP) address assigned to you by your internet service. We collect some of this information using cookies – please see Cookies in Section 9.2 for further information. We may also collect any personal information which you allow to be shared that is part of your public profile on a third party social network. Personal information we may receive from other sources: We obtain certain personal information about you from sources outside our business which may include Daimler group companies (Section 13) or other third party companies; the personal information received is as described in the two paragraphs above. information in any of these ways at any time. Please see Withdrawing your consent in Section 8.4 for further details. 3.2 Please see further How we use your personal information in Section 4 for details of the purposes for which we use the personal information we obtain from these sources and the legal basis on which we rely to process that information. The remaining provisions of this policy also apply to any personal information we obtain from these sources. 4.2 You may withdraw your consent for us to use your information in any of these ways at any time. Please see Withdrawing your consent in Section 8.4 for further details. We may use your personal information to contact you if there are any urgent safety or product recall notices to communicate to you or where we otherwise reasonably believe that the processing of your personal information will prevent or reduce any potential harm to you. It is in your vital interests for us to use your personal information in this way. We will use your personal information to comply with our legal obligations including: (i) to assist HMRC, the Police, the Driver and Vehicle Licensing Agency (DVLA) or any other public authority or criminal investigation body; (ii) to identify you when you contact us; and (iii) to verify the accuracy of data that we hold about you. for general administration including managing your queries, complaints, or claims, and to send service messages to you. We may share your information with other companies within the Daimler Group. They may use your personal information in the ways set out in How we use your personal information in Section 4, in connection with products and services that complement our own range of products and services, for example finance or insurance products. Please visit About Daimler Group in Section 13 for the details of our group companies with whom we may share your personal information. We may disclose your information to our third party service providers, agents, subcontractors and other organisations for the purposes of providing services to us or directly to you on our behalf. Such third parties may include cloud services providers (such as hosting and email management) or advertising agencies, administrative services or other third parties who provide services to us. When we use third party service providers, we only disclose to them any personal information that is necessary for them to provide their service and we have a contract in place that requires them to keep your information secure and not to use it other than in accordance with our specific instructions. We may share your information with other companies within our Authorised Dealer Network. They may use your personal information in the ways set out in How we use your personal information in Section 4 or in connection with products and services that complement our own range of products and services, for example finance or insurance products. We work closely with various third parties to bring you a range of products and services which are complimentary to ours. When you enquire about or purchase one or more of these products or services through us (e.g. via our websites), the relevant third party may use your details to provide you with information and carry out their obligations arising from any contracts you have entered into with them. We may transfer your personal information to a third party as part of a sale of some or all of our business and assets to any third party or as part of any business restructuring or reorganisation. We may also transfer your personal information if we’re under a duty to disclose or share it in order to comply with any legal obligation (e.g. by sharing your personal information with the DVLA), to detect or report a crime, to enforce or apply the terms of our contracts or to protect the rights, property or safety of our visitors and customers. However, we will always take steps with the aim of ensuring that your privacy rights continue to be protected. 6.1 All information you provide to us may be transferred to countries outside the European Economic Area (EEA). By way of example, this may happen where any of our group companies are incorporated in a country outside of the EEA or if any of our servers or those of our third party service providers are from time to time located in a country outside of the EEA. These countries may not have similar data protection laws to the UK. 6.2 If we transfer your information outside of the EEA in this way, we will take steps to ensure that appropriate security measures are taken with the aim of ensuring that your privacy rights continue to be protected as outlined in this policy. These steps include imposing contractual obligations on the recipient of your personal information or ensuring that the recipients are subscribed to ‘international frameworks’ that aim to ensure adequate protection. Please contact us using the details at the end of this policy for more information about the protections that we put in place and to obtain a copy of the relevant documents. 6.3 If you use our services whilst you are outside the EEA, your information may be transferred outside the EEA in order to provide you with those services. 7.1 If we collect your personal information, the length of time we retain it is determined by a number of factors including the purpose for which we use that information and our obligations under other laws. 7.2 We do not retain personal information in an identifiable format for longer than is necessary. 7.3 We may need your personal information to establish, bring or defend legal claims, in which case we will retain your personal information for 7 years after the last occasion on which we have used your personal information in one of the ways specified in How we use your personal information in Section 4.
and in limited cases, the law permits us to keep your personal information indefinitely provided we put certain protections in place. You have a number of rights in relation to your personal information under data protection law. In relation to certain rights, we may ask you for information to confirm your identity and, where applicable, to help us to search for your personal information. Except in rare cases, we will respond to you within 30 days after we have received this information or, where no such information is required, after we have received your request. You have the right to ask for a copy of the information that we hold about you by emailing or writing to us at the address at the end of this policy. We may not provide you with a copy of your personal information if this concerns other individuals or we have another lawful reason to withhold that information. The accuracy of your information is important to us and we are working on ways to make it easier for you to review and correct the information that we hold about you. In the meantime, if you change your name or address/email address, or you discover that any of the other information we hold is inaccurate or out of date, please let us know by contacting us in any of the details described at the end of this policy. Where we rely on your consent as the legal basis for processing your personal information, as set out under How we use your personal information in Section 4, you may withdraw your consent at any time by contacting us using the details at the end of this policy. If you would like to withdraw your consent to receiving any direct marketing to which you previously opted-in, you can also do so using our unsubscribe tool. If you withdraw your consent, our use of your personal information before you withdraw is still lawful. 8.5 Objecting to our use of your personal information and automated decisions made about you. Where we rely on our legitimate business interests as the legal basis for processing your personal information for any purpose(s), as out under How we use your personal information in Section 4, you may object to us using your personal information for these purposes by emailing or writing to us at the address at the end of this policy. Except for the purposes for which we are sure we can continue to process your personal information, we will temporarily stop processing your personal information in line with your objection until we have investigated the matter. If we agree that your objection is justified in accordance with your rights under data protection laws, we will permanently stop using your data for those purposes. Otherwise we will provide you with our justification as to why we need to continue using your data. You may object to us using your personal information for direct marketing purposes and we will automatically comply with your request. If you would like to do so, please use our unsubscribe tool. You may also contest a decision made about you based on automated processing by contacting the data protection department. In certain circumstances, you may ask for your personal information to be removed from our systems by emailing or writing to us at the address at the end of this policy. Unless there is a reason that the law allows us to use your personal information for longer, we will make reasonable efforts to comply with your request. you have objected to its use and our investigation is pending or you require us to keep it in connection with legal proceedings. In these situations, we may only process your personal information whilst its processing is restricted if we have your consent or are legally permitted to do so, for example for storage purposes, to protect the rights of another individual or company or in connection with legal proceedings. Where we rely on your consent as the legal basis for processing your personal information or need to process it in connection with your contract, as set out under Section 4 How we use your personal information, you may ask us to provide you with a copy of that information in a structured data file. We will provide this to you electronically in a structured, commonly used and machine readable form, such as a CSV file. You can ask us to send your personal information directly to another service provider, and we will do so if this is technically possible. We may not provide you with a copy of your personal information if this concerns other individuals or we have another lawful reason to withhold that information. You have the right to complain to the Information Commissioners Office (ICO) if you are concerned about the way we have processed your personal information. Please visit the ICO’s website for further details. All companies within the Daimler Group use technical and organisational security measures to protect the personal information supplied by you and managed by us against manipulation, loss, destruction, and access by third parties. Our security measures are continually improved in line with technological developments. Unfortunately, the transmission of information via the internet is not completely secure. Although we will do our best to protect your personal information, we cannot guarantee the security of your information whilst in transit to our website and any transmission is at your own risk. Where we have given (or where you have chosen) a password which enables you to access an account, you are responsible for keeping this password confidential. We ask you not to share your password with anyone. 'Cookies' are small pieces of information sent to your device and stored on its hard drive to allow our websites to recognise you when you visit. Information on the cookies that we use and their features can be found in the cookies section. In addition, if you linked to our website from a third party website, we cannot be responsible for the privacy policies and practices of the owners and operators of that third party website and recommend that you check the policy of that third party website. We use so-called social plugins (buttons) of social networks such as Facebook, Google+ and Twitter. After their activation, a direct link to the server of the respective social network is established. The contents of the button are then transmitted from the social network directly to your browser and incorporated in the website. After activation of a button, the social network can retrieve data, independently of whether you interact with the button or not. If you are logged on to a social network, the network can assign your visit to the website to your user account. A social network cannot assign a visit to websites operated by our other group companies unless and until you activate the respective button there as well. if you book a test drive or request a call back. We will only do so if you have consented to receiving such marketing information directly from us. 10.2 We may contact you with targeted advertising delivered online through social media and platforms (operated by other companies) by using your personal information, or use your personal information to tailor marketing to improve its relevance to you, unless you object. 10.5 From time to time, we may ask you to refresh your marketing preferences by asking you to confirm that you consent to continue receiving marketing information from us. Group in Section 13 below). 10.6 You have the right to opt-out of our use of your personal information to provide marketing to you in any of the ways mentioned above. Please see Withdrawing your Consent in Section 8.4 and Objecting to our use of your personal information and automated decisions made about you in Section 8.5 above for further details on how you can do this. We may review this policy from time to time and any changes will be notified to you by posting an updated version on our website and/or by contacting you by email. Any changes will take effect 7 days after the date of our email or the date on which we post the modified terms on our website, whichever is the earlier. We recommend you regularly check for changes and review this policy when you visit our website. If you do not agree with any aspect of the updated policy, you must promptly notify us and cease using our services. If you have any questions, suggestions or complaints about the processing of your personal information or wish to contact us to amend/update your marketing preferences with a UK company within the Daimler Group, please contact the Daimler UK Data Protection Co-ordinator. At Mercedes-Benz Retail Group, we're driven by one simple goal: to be the very best at all things Mercedes-Benz. That's been the ethos since our foundation at the turn of the century. 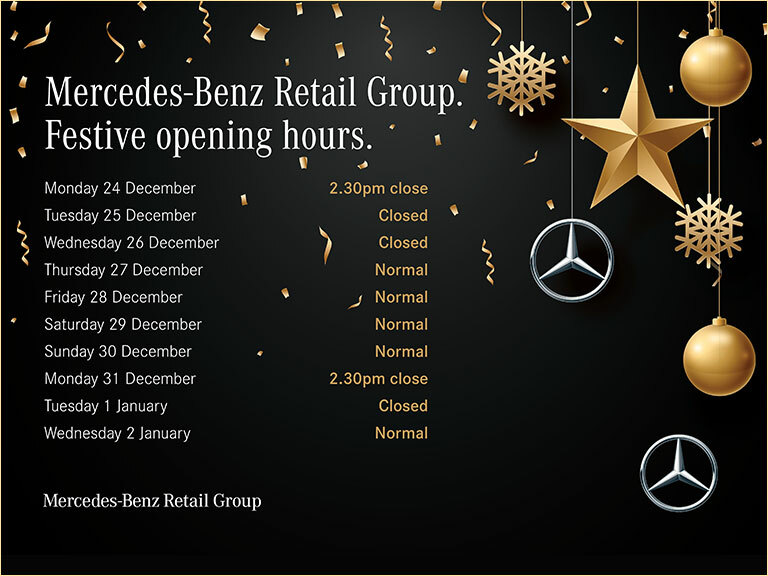 A decade on, Mercedes-Benz Retail Group consists of 14 retail sites, 4 used car sites and 9 smart centres across the North and South of London, continuing to deliver the highest levels of customer service possible. Welcome to Mercedes-Benz Retail Group. To optimise your experience, cookie settings on the website are set to allow all cookies. By continuing your journey throughout the website, you consent to this. You can change these settings here.